You may have seen one of the postgame interviews with the eloquent Marshawn Lynch. If you didn’t, don’t worry. It was over before it even started. “Yeah,” said Lynch, a running back, regarding the performance of the Seattle Seahawks’ offensive line after a win against the Arizona Cardinals. 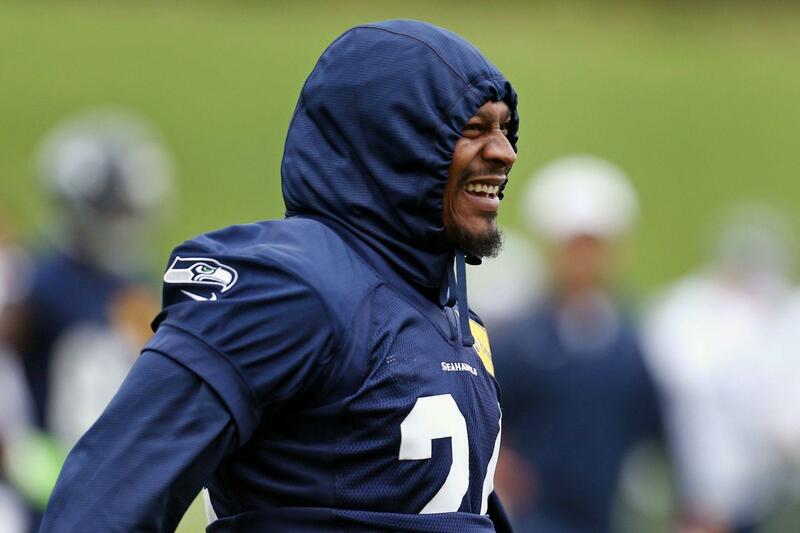 “Yeah,” Lynch said again when another reporter asked Lynch about the Cardinals’ defense. The air grew thicker, and the crowd became more frustrated as reporters continued to point their recording devices toward Lynch’s face, waiting for a detailed answer to their queries. While watching video of the interview, which now has more than 800,000 views, you can immediately sense the uncomfortable confusion of the reporters surrounding Lynch. Twenty-two questions and 50 words later, reporters still had nothing from Lynch. Lynch has been well-documented for this behavior. In November, the NFL fined Lynch $100,000 for not speaking to the media, which every player’s contract requires that they do. Since then, he has attempted to give the bare minimum to the press, the most recent evidence being the “yeah” replies. Many fans enjoyed Lynch and Westbrook’s responses to questions, and videos of each interview have accumulated hundreds of thousands of views. Unlike fans, however, these non-answers anger many reporters. In some ways, Lynch’s short responses were a bit immature and ridiculous. When you look at many analysts’ columns about Lynch and Westbrook’s interviews, you get the impression that Lynch and Westbrook were being selfish — that they refused to give answers to draw attention to themselves. But some reporters seem to be missing the point as to why athletes like Lynch and Westbrook answered questions this way. Perhaps Lynch and Westbrook refused to give the detailed, quote-rich answers that the media wanted because public figures aren’t always in control of how their audience perceives them. Sure, athletes control what they say and can easily give reporters more than a one-word answer, but they don’t have control over how analysts and viewers will react to their answers. The story, instead of what the athlete says, is about how he says it or how much or little he says. This is the case with Lynch. But when he says “yeah” as every response, he gives writers like Edholm little choice but to write about it. The focus of the story becomes about how Lynch is unresponsive to the media, and as a result, Lynch may be inclined to continue avoiding the media. It becomes a vicious circle. Maybe Lynch and Westbrook want their actions on the field or the court, not their words afterwards, to define them. Days after his interview in November, Lynch said he wouldn’t do any interview if he wasn’t obligated to, because, to him, an interview is “just words to people.” To Lynch, when he’s “actually out there, in the field and in the streets, doing it,” people understand who he is and his personality. But Edholm doesn’t realize that he could very easily be writing about something else. He could use an interview from the media-friendly Russell Wilson to write about the Seahawks’ win, instead of focusing on Lynch’s one-word answers. Although he believes Lynch’s short answers limit his stories, Edholm doesn’t realize that he — as well as other reporters, columnists and analysts — is what made Lynch’s interview something to write about in the first place.